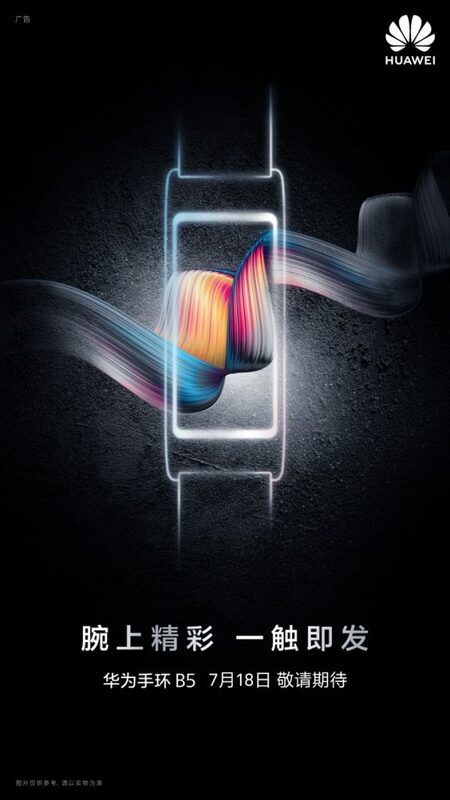 Huawei TalkBand B5 July 18 Launch Event Announced - Playfuldroid! Huawei is holding a launch event on July 18 to unveil the Nova 3 smartphone. The announcement was made through the company’s Weibo account. Two hours after announcing the Nova 3 launch event, the company has also confirmed that the rumored TalkBand B5 will also go official on the same date. As it can be seen in the image below, the Huawei TalkBand B5 (Bracelet B5 according to translated text) will go official on July 18. Nova 3’s launch event will be held at the Shenzhen Universiade Stadium. It seems that the same venue will used to announce the arrival of TalkBand B5. The existence of TalkBand B5 was recently confirmed by the popular tipster Evan Blass. The Weibo post that confirms the arrival of TalkBand B5 highlights the major feature of the device. It states that it is a Bluetooth headset on the wrist which can be released and used to talk freely. In 2016, the company had launched TalkBand B3 and since there was no B4 device in 2017, it seems that the TalkBand B5 is the successor of B3 which featured in-ear Bluetooth headset with monochrome display. A recently leaked press render of the device has revealed that it will be coming with a larger color display. The wristband is also equipped with health-centric features like sleep tracker and heart rate monitor. The pricing of the TalkBand B5 is still under the wraps.